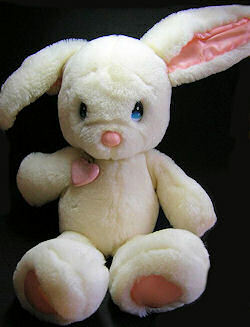 I’m looking for an 80’s Applause Precious Moments white rabbit named Snowball with pink satin ears and feet. There’s a pink plastic heart attached at the neck. This bunny was the very first stuffed animal given to me at birth. I lost it when I was 12 years old and was very devastated. I have searched for it with unsuccessful results over the years. I would love to find it somehow. I found one post on etsy.com selling it, but I was too late. Any help would be most appreciated. Its original name is SnowBall 1985 applause Precious Moments bunny. “Snowball” or BunBun as I call him was my first stuffed animal as well. I am fortunate enough to still have him. Good luck! I have one. Almost perfect condition just wear on the nose. I am asking $250 for him. I have this bunny that with the tag on ear (applause) the original paper tag still attached and the heart necklace – there are no worn spots at all – it is in mint condition, I am asking $300 for this. I would love to buy snowball from 80’s applause. Precious moments.